Most people would agree that Stone is known for intense, in your face, hoppy beers, but even breweries need to try something a little different sometimes. So when news of Coffee Milk Stout started surfacing I was kind of interested that they would take such a deviation from their usual offerings. To be fair, Stone does have quite a few offerings that don’t fall into the “hop bomb” category, like the Smoked Porter and their seasonal Saison. 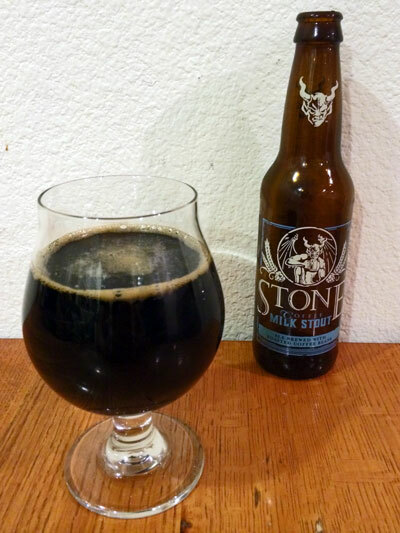 Of all the non-hoppy styles that come to mind, a milk stout was the last one I’d expect Stone to pursue, but in usual craft beer fashion this beer has an interesting origin story. 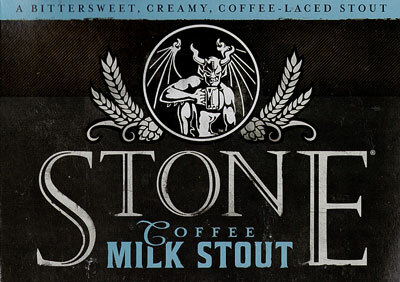 Stone’s Coffee Milk Stout started out as an idea between friends, friends who happened to meet at a Highland Games competition in California. At the time, Brian Gallagher (in the middle of the picture to the right) was still a humble home brewer with aspirations of making it big. He happened to meet a fellow competitor that was starting up a coffee roasting operation in Northern California and the idea of a coffee beer was born. 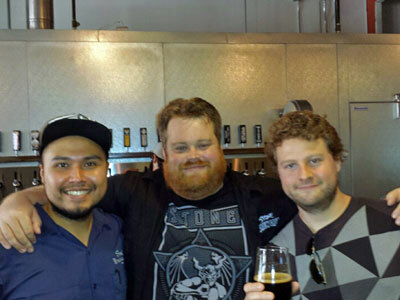 The recipe for a coffee milk stout was worked out over several years with the help of friends and neighbors in the greater Los Angeles area where Brian’s family is located. The odd part of this story is that Brian does not drink coffee, so he had to rely on others to help him perfect the coffee flavors in his beer. Brian was later hired on as an assistant brewer at Stone and his coffee milk stout became a pilot batch called Gallagher’s After Dinner Stout at Stone Brewing World Bistro & Gardens. After the success of this pilot batch, Stone proceeded to add this beer to its newly minted seasonal line for a limited production on their main system. The final recipe for this beer has all of the refinements of both the homebrew recipe and the Stone pilot batch. The full production batch uses Ryan Bros’ Coffee from San Diego, Magnum hops, British mild ale malt, and milk sugar. Unlike other coffee beers, they add the coffee beans into the mash which allows the coffee flavors to steep out with the malts. The English mild ale malts help give this brew some extra body and the milk sugars, which are not fermentable by brewers yeast, add a touch of sweetness. All of this comes in a sessionable 4.2% ABV, which allows the flavors to really shine. The beer pours black with a quickly dissipating mocha head. The aroma has exactly what you’d expect, with deep roasted coffee and hints of chocolate and sweet lactose. It has a relatively rich body and lively carbonation, giving it a creamy texture. The flavor is a good mix of roasted coffee and bitter-sweet cacao with a hint of dairy sweetness. The finish is on the drier side with what can only be summed up as a dry mocha flavor that lingers for a bit. With the majority of milk stouts that make it to LA being of the higher ABV variety (Noble’s Naughty Sauce, Eagle Rocks’s Dairy Tank, and Stone’s Xocoveza Mocha Stout collaboration), it’s nice to see a more sessionable version of the style receiving wide distribution in LA. This beer has a nice malt backing, some great coffee flavor, and just a hint of lacto sweetness. In the absence of other milk stouts (I’m looking at you Left Hand Brewing…), this beer is a great addition to the diversity of styles available in the LA market. I highly recommend checking out this brew while it’s still available. As of this point, this beer will hopefully make a second appearance around August of next year but, as with many things, this is subject to change. This entry was posted in Seasonal Beer. Bookmark the permalink.